“How dull might the world be without clouds and mountains and trees? How utterly drab without people, animals, lakes and streams? And how lifeless the walls that surround us without paintings of such things to take their places when we can’t immediately go and see them? “I have been drawing and painting since my early childhood. My family has always been supportive of my art so I was encouraged to draw and paint growing up. One of my favorite things that I was privileged to do was to go to painting lessons once a week after school. I was also privileged to grow up in one of the most beautiful and diverse areas in the world – the Reno-Tahoe area. I grew up out in the sticks and I think that has had a definite influence on the subject matter I most often choose to paint – Sierra landscapes. “Each painting I do is an extension of myself. There is something nagging at me on the inside that just has to come out and be put down on the canvas – something that’s more than you could photograph, more than you could even manipulate digitally. If I can’t paint I get antsy. “Painting is an amazing thing. A good painting has the ability to arrest a viewer’s attention and hold it for a while. Like a good book, a good painting can transport you elsewhere. I try to make each painting dramatic, not the cheesy kind of dramatic, but the awe inspiring dramatic that makes you want to stop and look twice. I try to make my landscapes somewhere you want to be. “Each painting is also a growth piece; I’m continually striving and attempting to grow. Where I want to be as a painter always seems to be ten paces ahead of where I currently am. I suspect it will be like this ‘til I’m too old to hold a brush. At different phases of my life, I’ve allowed painting to be put on the back burner. I’ve resolved to not let this happen again. I paint most every day. Life for me is better that way. Mike Callahan lives near Reno, Nevada. 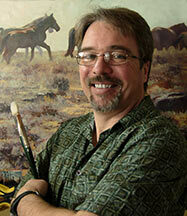 He paints subjects ranging from North American wildlife, Western themes, Sierra landscapes and classical portraiture. He paints in oil on canvas using a limited palette of three colors plus white. Mike also currently holds a day job as Technical Graphics Trainer responsible for the training and development of staff graphic artists as well as the innovation, development and implementation of new production techniques utilizing Adobe Illustrator and Photoshop. To see Mike’s work in-depth, find out about current exhibitions and to gain a fuller glimpse into this artist’s life, please visit his website at http://www.mikecallahanart.com. A: I’m not really sure how to answer this question. I mean, on the one hand, I think I’ve been an artist since I can remember being able to make a mark. My earliest memories of actually creating something others would spend time looking at are drawings done at my grandmother’s kitchen table. She and my mother were my earliest fans and encouragers. When I was about 12, my mother sent me to weekly painting lessons where I learned the most elementary of principles of painting, but mostly learned to be unintimidated by oils. I never took any art classes in High School as I was a bit cocky and felt I was probably above that somehow. After High School, I went to a small time technical school to study commercial art, but after six months in the program, the school kind of started to fall apart and at the same time lost a brother tragically. This was in the early eighties. Faced with fairly dire circumstanced for me at the time, my young wife and I moved back to Reno and in a short time started a family. Being totally unprepared by my inadequate schooling, I eventually backed by way into the graphics industry by working in the sign and screen printing field. That eventually led to my job with a large gaming company which eventually went from manual art and prep to digital. I started using Photoshop at version 2.0. During those years however, I still would create at least one oil painting a year. In 2002, I was commissioned to create a painting for use on a poster promoting the Great Reno Balloon Races and it was then that I decided I wanted nothing more than to paint all the time. It was shortly after that that I started painting nearly every day, which I still am doing. A: I have very little formal training. After the program at the technical school fell apart, I was able to study one on one with one of my instructors from the school, but only for a couple of months. The techniques we were using then were far removed from what I do today (though I suppose I learned some general principles about values, drawing, etc.) I attribute most of what I do today to my own study of the medium and the works of other great artists. I also from time to time try to read anything that artists I admire write or say in interviews about their techniques or insights they might have. A: I do, but my supplies are minimal. I use only four colors of M. Graham Artists’ Oil Colors . They are, Titanium White, Quinacridone Rose, Hansa Yellow, and Pthalocyanine Blue. I use M. Graham Walnut Oil and a little Weber Turpenoid and that’s pretty much it. For brushes, I use Winsor & Newton and Connoisseur synthetics ( I really love those as far as synthetics go!) As far as plein air, I recently bought an EasyL box with the sturdy tripod they sell and really like it so far! A: I guess one could consider my style, for the most part, traditional realism. I paint mostly landscapes, but enjoy figurative and portraits once in a while. I like to work the figure into the landscape and Western theme paintings lend themselves to this as well as allowing me to paint a few animals from time to time. A: Craig Nelson has a good book, “60 Minutes to Better Painting” that I would recommend. If you can get a copy, I also recommend Edgar Payne’s “Composition of Outdoor Painting”. Also, pretty much any book that features the art of John Singer Seargent is good for studying what he did, but not necessarily for technique directly. I have a fair number of art books, but those are the ones that stand out in my mind at present as ones being useful to new artists…oh yeah, and lastly, my e-book which I wrote specifically for the artist, “My Approach to Painting the Landscape in Oils” available for free download on my website. A: Mostly, my inspiration comes from hiking around the Sierras with my camera. Specific times of day when the light is spectacular (usually early or late in the day) give me a lot of ideas and I usually don’t have to look to far for abundant reference. Additionally, from time to time, I look at other artist’s work. Seeing their mastery inspires me to step my own work up a notch or two. A: There are a lot. To mention a few who come to mind readily, John Singer Seargent, Edgar Payne, Clyde Aspevig, Scott Christensen, and Daniel Gerhartz. But there are a lot more. I have tons of artists’ sites bookmarked and usually a couple of times a week I pick a few of their sites to go through and re-acquaint myself with their work. Currently, I guess the one thing that other artists do that I find inspiring is bold and masterful brushwork. A: I think the biggest struggle beginning artists face is coming to grips with the reality that painting is not easy. It takes lots and lots of brush mileage (to use Craig Nelson’s term) to be able to start producing a decent painting. There will be a lot of “bad” paintings done in the process of getting to that point. However, don’t give-in to the temptation to abandon your attempts before finishing. I have that as a strict rule for myself, finish every painting no matter what. If you abandon your work before bringing it to completion, you will never progress. You will never be able to adequately assess your shortcomings and therefore never be able to take the necessary steps to grow and overcome them if you bail out when the painting gets tough or frustrating. A: I have a “day job” which doesn’t allow me as much time in the studio as I would like…additionally, though my children are grown, I still like to spend time with my family. I know too many artists who allow these same situations to keep them from ever doing much painting. I have carved out an hour and a half of every day to paint (maybe a bit more on the weekends, but sometimes not) by getting up at 4:30 am to paint. I’m a morning person, so this works for me, however, I want to encourage artists to carve out at least an hour each day (whether early morning, mid day, evening or late night) to devote to painting. If you do this, you will be amazed at how much painting you get done and how much you grow as an artist.